French people seem to be mad about dogs. Everyone has one, whether on a leash, in a bag, in a basket on their bicycle, or even carrying them around in their arms like a baby. (At least they don’t put them in clothing, as people tend to do in Asia.) 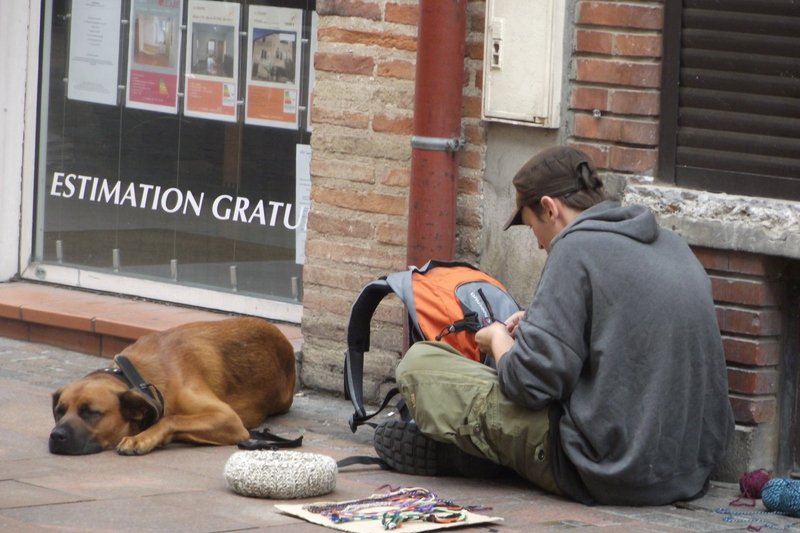 Even homeless people all have dogs, and Toulouse (and Paris too, come to think of it) apparently has a lot of homeless people. I really don’t know why… perfectly healthy looking young people, living in tents by the river, and sleeping on sidewalks. And without fail, all of them have dogs, probably both for companionship, and for protection. Now the problem with living in a town full of dogs is that there is merde everywhere, and I hope you don’t need me to translate that word for you. This is definitely something I do not like at all about France! Sidewalks with doggy doo all over the place, smeared on people’s shoes or left in huge piles in the middle of the walkway for people to dodge. What is up with this? How can you watch your dog do this on a public sidewalk, and then just walk away and leave it for people to step in? In most places in Asia this wouldn’t be allowed. In Hong Kong it is the law to walk with a plastic bag to pick up your dog’s business, and there are bins everywhere specifically for disposing of these bags. But in France, you have to always watch where you step or you really get into the thick of it! This is sooo ture! I noticed this when I worked on ships,that all French people have dogs and let them do their business just about anywhere and everywhere, its most disgusting.It happens here in Croatia too,but its not as bad,I think most people here have cats more than dogs. Good! I fully support the idea of more cats and less dogs! By the way, this is not related to dog crap, but yesterday I saw a man pee against a church! And people were walking by and nobody seemed the little bit disturbed. Not only do dogs go anywhere, the guys seem to pee anywhere too….